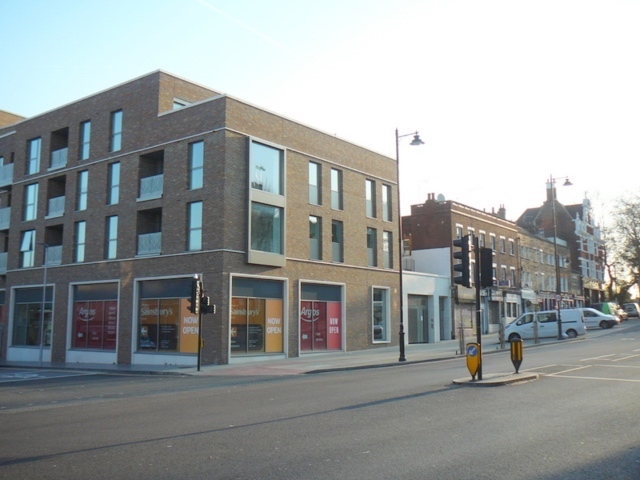 This major building development on a 13 acre site in Hornsey High Street has radically altered the appearance and character of Hornsey Village. What was there before the bulldozers got to work? 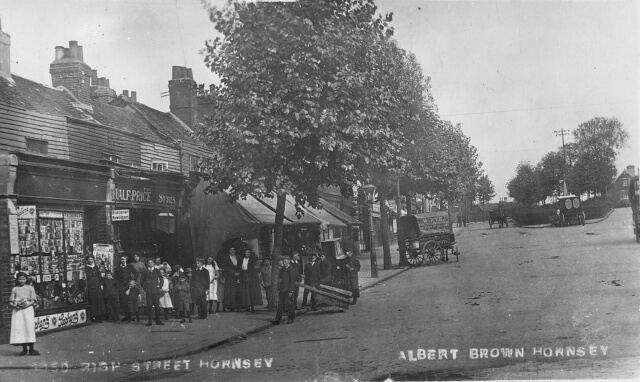 If you had walked down the northern side of Hornsey High Street before the end of the 1920s your eyes would have been drawn to two short parades of weatherboard cottages converted into shops. They looked quaint amongst the fine Edwardian buildings around them and indeed they had been meeting the needs of Hornsey Village shoppers since around the 1860s. The narrow passageway through to Allen’s Court marked the old route of the New River before it was diverted further east in the 1850s. No planning application was required then! In 1890 Hornsey Local Board called for a special report on the state of insanitary housing from Dr Henry Clothier, its Medical Officer of Health, focusing mainly on these courts. His judgements do not make happy reading. 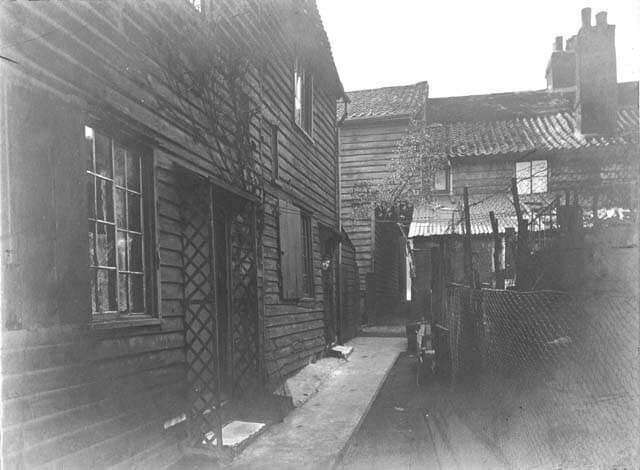 This alley, leading off the High Street next to Speedwell Cycle Shop, consisted of four wooden houses with mansard roofs probably built c.1840. The wooden walls were found to be in pretty good order and there were some water shoots (gutters) but no pipes into which the water could run. There were two water closets (WCs) for the four houses but no water was laid on. Occupants fetched water from two cisterns which were lined and covered with zinc. There were no dustbins but the occupants were trying to keep the partially paved yard clean. Clothier judged that the tenants and landlords were endeavouring to make the best of a situation which could easily develop into an unsanitary and unacceptable state. The state of this court was much worse. 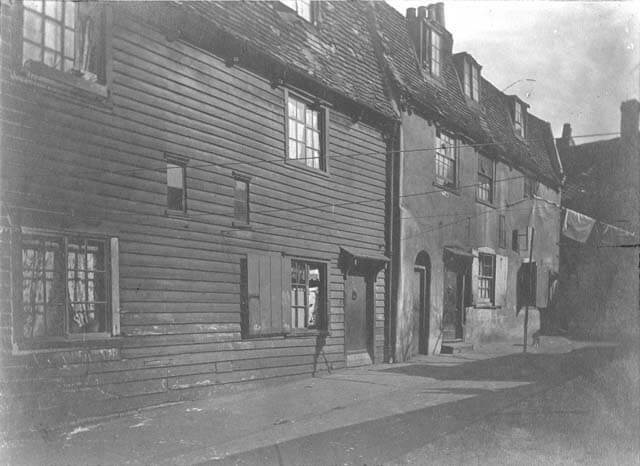 There were four houses, two of which were wooden, situated near a property which the Hornsey Local Board owned. The court was unpaved, very dirty, and the soft surface partly covered with cinders and brick rubbish with here and there a piece of sacking to keep the children out of the mud. At the entrance there was a good iron cistern which supplied the four houses with water from the New River Company but close to this was a drain with a defective trap which failed to take the dirty water. There were three WCs for the four houses, supplied with water but the supply was defective. The wooden sheds in front of these houses served as coal and wood cellars and were ‘very tumble down affairs’. There was one wooden bin for fire ashes for all the houses. There were no gutters to take the rainwater. In both courts the buildings were crowded together which provided insufficient air space. Six out of eight of the houses were wooden and along with a range of rickety out-buildings and the wooden fire bin were major fire hazards. Clothier concluded that the houses would soon become too dilapidated to be repaired and would be pulled down leaving Hornsey,’eventually be free from this class of dwelling’. However, the special report made little difference to life in Allen’s Court and Preston’s Court which were not pulled down for another 40 years. The National Hall, now the Turkish Religious Foundation of Unit UK and Diyanet Mosque, was built to the west of the courts in 1888, and the Sanitary Depot opened behind these courts in 1886. Eventually the courts were demolished in the late 1920s to make way for Hornsey’s municipal baths and wash houses. 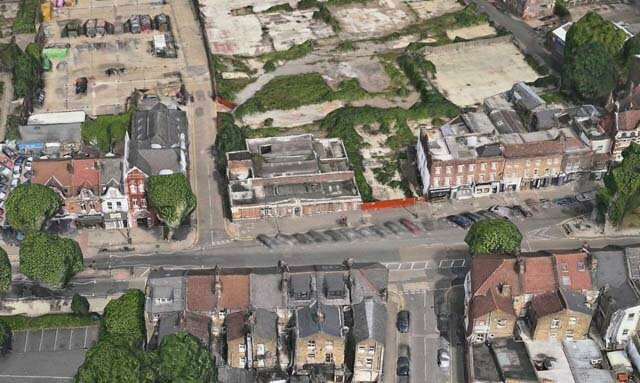 These in turn were demolished when the Smithfield Square bulldozers arrived. The only survival is the main doorway to the baths with a stone Hornsey coat of arms above it. It stands on its own – the facade to an electricity sub-station. If you have any memories of what Smithfield Square used to be like, we would love to hear your recollections in the comments section below.